This is not my recipe. It was passed on to me by one of the very special members of the Brisbane Paleo Group, Marg. I just love Marg and her husband Allan. They were the first people I met at our very first meet up. They are always so supportive and attend as many meet ups as they can. In the beginning they did not even live in Brisbane and would drive hours to attend. Amazing! It is people like Marg and Allan who motivate me to keep the group running. At our last meet up, Marg handed me one of these cupcakes to try. It was super moist and the best thing was it took no time to make! Thank you Marg for sharing this with me. * This recipe is a variation of the Microwave mug cake you may have seen before. 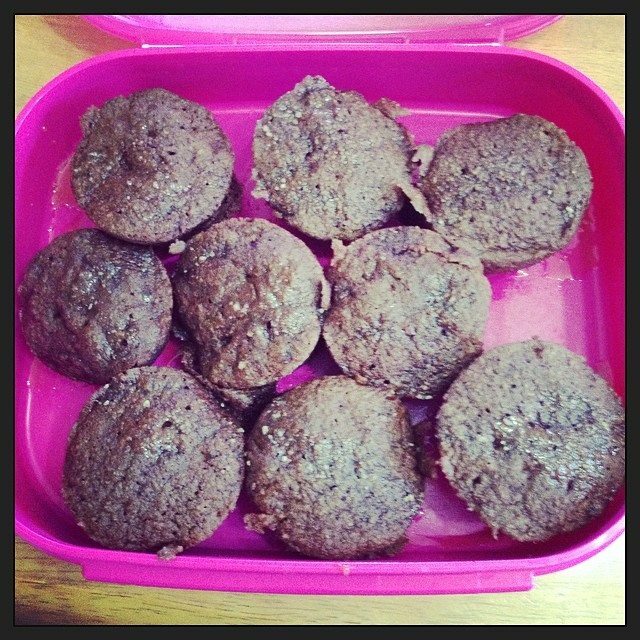 But it has been adapted to make cupcakes that are perfect for school lunches or a quick snack if guests arrive. Mix all the ingredients in your Thermomix or food processor. Divide batter into microwave safe muffin tray. Microwave for approx 3-3 1/2 minutes. Time will vary depending on microwave. The key is not to overcook as they will become dry. Optional: I made a glaze to go over the top by mixing 2tbs coconut sugar with 1-2 tsp water and mixing well until sugar dissolves. Spaghetti squash or vegetable spaghetti as it is sometimes known is the “king” of paleo pasta substitutes and is becoming easier and easier to find as it gains popularity. I love it because my three year old loves it. If he is eating vegetables then I am happy. My first attempt at cooking it I boiled it. I think I may have over boiled it and it did not taste so good. 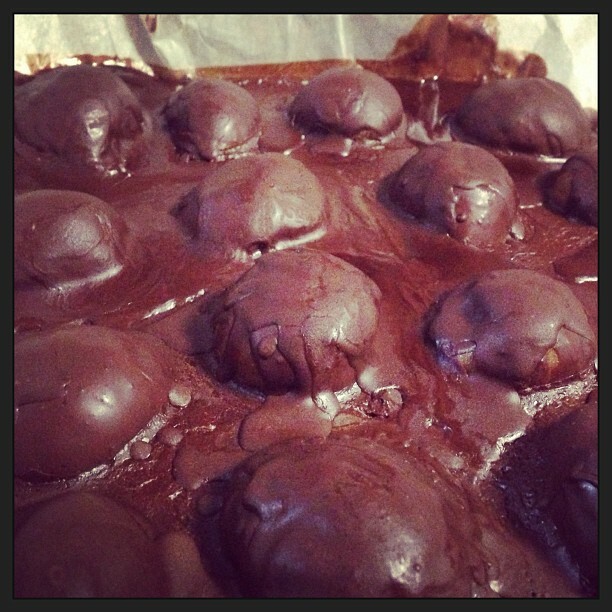 So then I tried this Nerd Fitness recipe and baked it. This turned out a lot better. A few times we have had bolognese with the squash which has been ok but I much prefer zoodles (zucchini noodles). Singapore noodles is a pretty common recipe and the spaghetti squash reminds me of vermicelli so I thought I would give it a go. Heat pan with sesame oil. Add vegetables and curry powder. 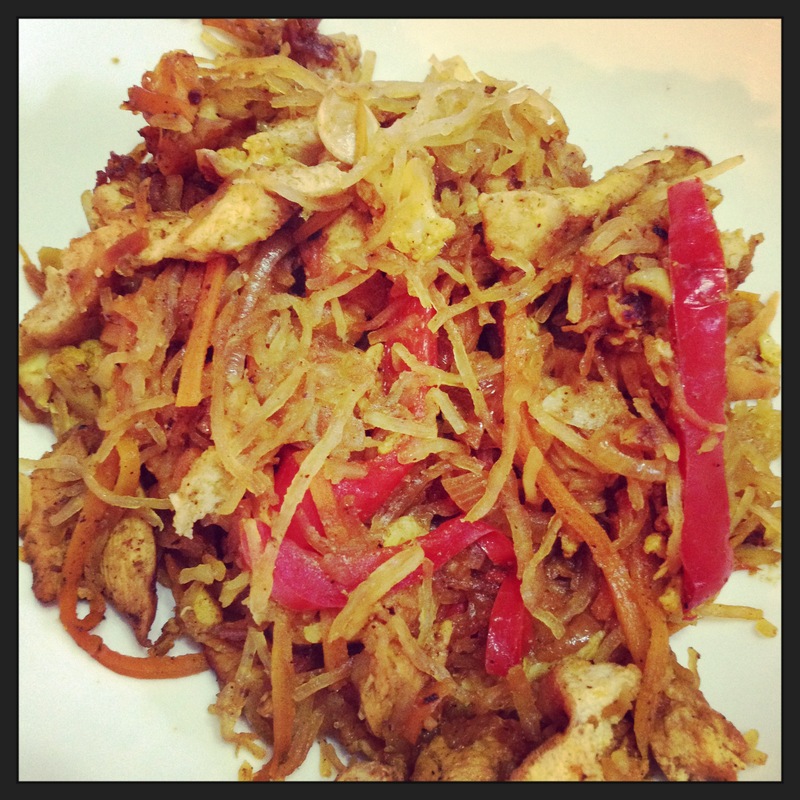 Once vegetables look cooked enough add spaghetti squash, egg, fish oil and coconut aminos. If you like you can add prawns, bean sprouts, coriander and any other vegetables you have. I love making meals where you can re-use again the next day so I still had half a spaghetti squash and we made Paleomg Spaghetti Squash Breakfast Bake. Which was delicious. Where do I get my spaghetti squash from? I get asked this question a lot! I get mine from Crisp on Creek Mt Gravatt but if this is not in your area then check out the Vegetable Spaghetti page and find your closest stockist. 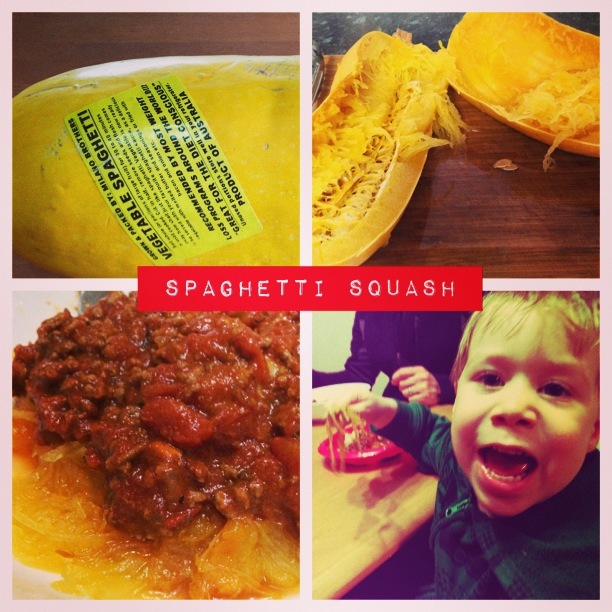 Let me know your spaghetti squash creations! What makes me really happy is seeing the positive effects of the Paleo lifestyle on human beings including myself. This is why I organise the Brisbane Paleo Group. Sometimes it is easy and sometimes it is not. But whatever journey you are on the end goal is all the same for us – we just want to eat real food! 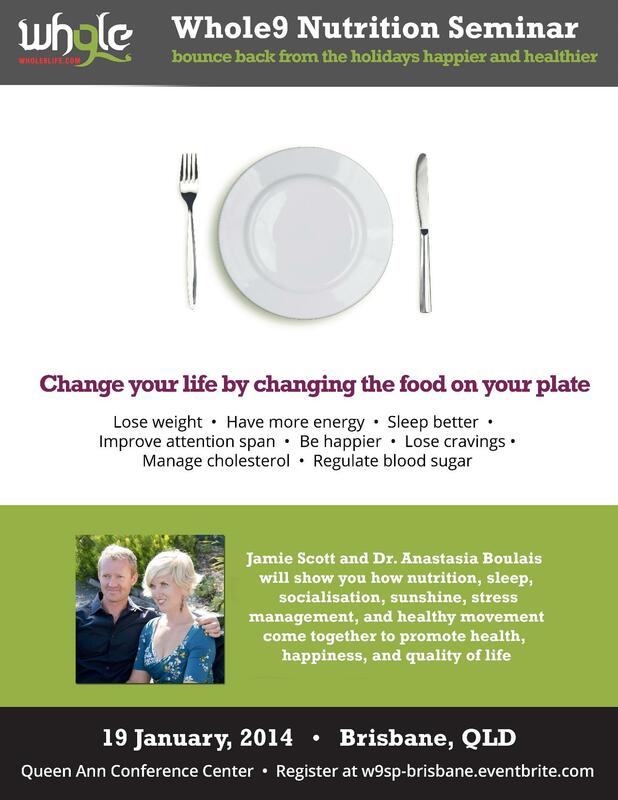 Earlier this year I was lucky enough to attend the Whole 9 South Pacific Nutrition Workshop and see Jamie Scott and Dr Anastasia Boulais present. I had been following paleo for a while, I had read “It Starts with Food” but I was still interested to attend and I am so glad I did! I got so much more out of the seminar than I expected. A clear understanding of what my plate should look like, easy to understand explanations as to why we eat this way, little tips on other aspect of the paleo lifestyle other than just the food so that I could feel confident going away and starting my Whole 30. One major thing my family commenced after I attended was, we made meal time an event. We turn off all electronic devices, set the table and eat altogether. It has really made meal time an enjoyment. So much to my excitement I have one ticket to give away to attend their upcoming Brisbane Event on the 19 January 2014 *terms and conditions apply. While you are there you might like to check out the Brisbane Paleo Group on Meetup and be notified of all our fabulous events. This giveaway runs from Saturday 28 December 2013 and closes at midnight AEST on Friday 10 January 2014. The top three best answers will be sent to Whole 9 South Pacific to select the winner. The winner will be notified on this blog and via email. It is valid for one ticket to the Whole 9 Nutrition Seminar on Sunday 19 January and is not transferrable. Should the event be cancelled prizes will not be awarded. Seems you have caught me on a day when the fridge is almost bare (for us)! What’s that in my fridge you ask? Well it seems to be a lot of Tupperware! Bet you thought it was going to be full of meat hey! Some of Quirky Cooking’s salted caramel (delicious) and Cyndi O’Meara’s paleo bread. The door looks bare but it is normally full of eggs! We go through around 3-4 cartons a fortnight. We drink Kombucha- a fermented tea drink (brewed ourselves but recycled in the Buchi bottle!) We also have a soda stream to make fizzy water which is great when you want something a little different then just water. It is great with lemon or lime slices. We do have a little dairy in the fridge. My husband and 3 year old still have milk (yuck supermarket milk but we had run out! ), organic yoghurt and westgold butter. The dog also eats paleo as in he eats fresh chicken necks! We try and do the best we can do on the budget we are on. Organic fruit and veg, grassfed and organic meat where possible and the rest I buy from Aldi. Thanks for taking a look in my fridge! Foods that are given the Heart Foundation tick are not what I consider to be real food. My family has a history of heart disease. My Grandmother, Iris died from heart disease. My daughter, Iris is named after her. I want her to grow up eating real food. Read through the petition and see what you think and if you like what you read please sign it! What’s all the biz with this RAW food fad? I am feeling left behind! Am I just getting old? Speaking of which is it cool or uncool to get your doc marten boots back out since they are in fashion again? Anyhow I decided to give this RAW business a go and to my surprise this (kinda) paleo friendly treat was quite easy to make. Blend altogether. Place baking paper on baking tray, push mixture into baking tray by placing another piece of baking paper on top and pushing down. Place in refrigerator until mixture hardens. Last summer I brought a box of apricots, hulled and froze. I used these but you could use any fruit. I like the tartness of the apricot with the sweet mixture. Heat coconut oil until melted. Add the rest of the ingredients and pour immediately over. The mixture sets very quickly and reminds me of ice magic! Place in refrigerator over night. Cut into squares and eat straight away! Do you ever have those days when you wonder why you are doing something – what is it all for? I had a few questioning days like that in the last couple of weeks. When a call out was made late last year to help organise the Brisbane Paleo Meetup Group – I jumped at the opportunity. I am passionate (not fanatic) about Paleo. For the first time in my life I am totally in tune with my body, I feel fantastic and I have Paleo to thank for that. So why not share my enthusiasm with other like-minded people? Our first meeting was a fantastic turn out of around 20 people. We went around the table and shared our stories with one another. Every story was inspirational and empowering. Even those just starting on their journey could feel the support and encouragement from the group. Isn’t it amazing when you find a group of people all on the same page as you? During this time I was so lucky to have had contact with Jo. Jo – an amazing person and the organizer of the Melbourne Paleo Meetup Group! When everything seemed like it was a little too much I contacted my Meetup “mentor” (as I am now calling her!) and she gave me some sensible advice. Why not put it to the group? 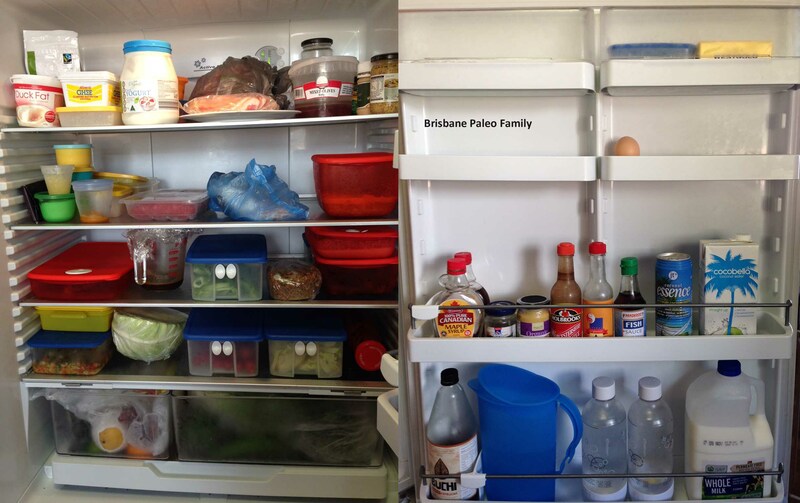 The Brisbane Paleo Group is a bunch of fantastic people – I knew this so I focused my energy on the next Meetup, wrote down my concerns and put it to the group. The weather was glorious, we had a nice turn out for a Paleo picnic and the group shared the issues and helped find solutions. Sitting around talking to the group, sharing food, feeling totally comfortable with these people made me wonder why I questioned why I was doing all of this! It was obvious! People join Meetup for all kinds of reasons but the most common response I hear is to “meet other like-minded people”. It is wonderful to be able to share your views, recipes, have discussions with people who understand, learn, grow and where you don’t feel like you are being judged or having to justify why you do this. I feel energised, inspired and keeps me on track this is why I Meetup! Cream, Butter Bells and Soda Streams these are just a few of my Favourite things! At the moment I am as busy as ever but I am also heading into my third trimester of pregnancy and I am really feeling my body start to slow down! In my first pregnancy I never really had any particular food cravings but I did really enjoy drinking milk which I don’t normally. This time round I still don’t have any “real” cravings but I can’t get enough full fat cream! I never over eat it as it makes me feel full but it feels like I am having an incredibly naughty treat. I can whip it in the Thermomix in a few seconds! Speaking of Thermomix and cream I have been making my own butter. 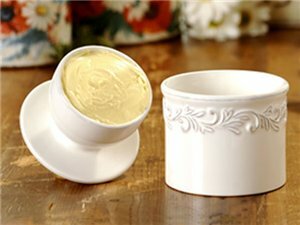 Homemade butter is like no other – it’s really like solid cream! But the thing with real butter is it’s hard straight out of the fridge and who has time for it to soften? And in our Queensland weather there is no leaving butter on the counter. Hello ants and fruit flies! My friend Julie ordered me this amazing thing – a Butter Bell. I am sure they have been around for years but we never ate real butter growing up so I had never heard of a Butter Bell. Its basically a vessel to keep your butter soft and from going rancid without using the fridge. You just fill it with a little cold water every three days and the butter stays fresh and soft. My other favourite thing at the moment is fizzy water! I was sick of carrying bottles of mineral water back and forth from the shops – let alone the amount of plastic we were consuming in the house so I brought my hubby a Soda Stream for Christmas. Thinking he would think it a gimmick and never use it, I braced myself for the “oh that’s a nice present” but instead of putting it aside he actually uses it regularly and it is a definite favourite thing in our house! After completing the Whole 9 Seminar a few weeks back a few of you may have seen my Facebook posts on practicing good meal time habits. We have cleared the table of electronic devices, turned the TV off, set the table and we pour ourselves a wine glass of “fizzy water” with a slice of lemon or lime. It is amazing how good fizzy water tastes out of a wine glass. I am not kidding give it a try! Our dining table complete with flowers from the garden and home made decorations by the 2 year old. My last favourite thing for today is Lamb – grass fed lamb that tastes like Lamb your grandmother used to cook! I placed an order with Mitchell Grass Meats last month and ordered a 10kg lamb pack. It was great value for money with 2 amazing lamb roasts, lamb chops, shanks, necks and other cuts of lamb. We have enjoyed the beautiful fresh taste of the lamb and we will be ordering again. If all else fails science will help my 2 year old eat veggies?!? In my last post on this 3 part series I will discuss what I am putting in my son’s lunchbox. I find lunch time the hardest meal for myself let alone what to pack in my son’s lunchbox. It’s easy to get busy and start looking to pack convenient “packages” into the lunchbox and soon you have a convenient box of processed food and sugar – not good! A sandwich on white bread with spreadable butter with jam/honey/vegemite/cheese slice. While it might have been convenient for me to pack each day I would not call this a very healthy lunch for my 2 year old. Plus it was also very expensive and a lot of the food especially the sandwich would come home and be thrown out. I had a chat with one of the daycare teachers and she suggested instead of the sandwich I give him leftover dinner – brilliant! That’s what we have for our lunches so packing another one would be no problem. Then I looked at a cheaper option for the pre brought yoghurt. I decided on plain full fat greek yoghurt as the flavoured yoghurts are full of sugar. I normally go for the Aldi organic greek yoghurt or Jalna brand and I add a handful of frozen raspberries (quite inexpensive from Aldi) and by the time he eats it the raspberries are soft and sauce like. On Sundays I make up divide up the yoghurt into small containers with the raspberries and have them sitting in the fridge ready to go for the week. I also decided that making up a batch of biscuits for the week where I am able to control the ingredients going in is far better than store brought. When I brought my thermomix I also started making my own dips and whatever other things I have time to make for the week. On Sunday I made two batches of biscuits, some banana custard, some fruit balls and dinner in around an hour which lays the foundation for a good week ahead. At the end of this post I have included some recipe ideas that have worked for us. Whilst it is not strictly Paleo I still feel much happier about what I am sending him to daycare with and the bonus is, it’s healthier, costs less, only takes a little bit extra time to make these things (especially in the thermomix) and I know what I am giving him. Thermomix Wheat, nut and dairy free muesli slice – I leave the sugar out altogether as honey, apple and dried fruit is sweet enough and don’t add the white chocolate. This one has oats and rice so is not strictly paleo. Teresa Cutter – a staple in our house! Eat like a Dinosaur has some great recipes as well. Has anyone seen the latest Aldi lunchbox campaign? Sorry Aldi in my eyes reduced fat milk drinks, 99% fruit juice, a snack pack, small packet of chips for variety in a “balanced “ lunchbox is not an option in my child’s lunch! This week on Low Carb Conversations Podcast www.lowcarbconversations.com I chat with @nta_australia Associate Instructor for Sydney,Charlotte Hill @chillandnourish Learn more about the Sydney class starting soon as long with Charlotte’s knowledge of corporate health. We discuss real food vs supplements, sleep, nap desks and eating slower. Tune in to hear more! Had a wonderful brunch at @wildthymedining at Murwillumbah today. Low carb/Keto/GF options. I had a breakfast bowl with lots of greens, avocado, keto friendly seed bread and a side of bacon. Super delicious!